Dr Matthew Paris (right) and national coach Vic Hermans during today's futsal launch. The Malta Football Association is adopting a holistic approach in a bid to improve the level of the futsal competitions, the national team and coaching education. 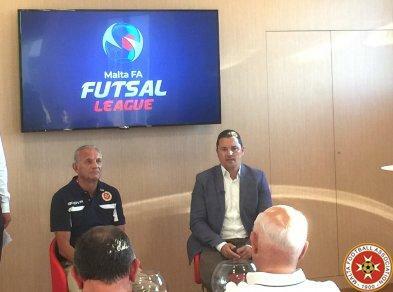 Malta FA Vice-President Dr Matthew Paris gave an overview of the 2018-19 futsal competitions and the plans for the national team, now under the guidance of Dutch coach Vic Hermans who was presented to the media on Tuesday. The 2018-19 futsal season gets under way on 14th September, 2018 with the Super Cup clash between champions Valletta FC Futsal and University of Malta Students’ Futsal Team, winners of the Knock-Out last season. The Super Cup will be followed by a training camp for the national futsal team who are due to play two friendly matches against the Netherlands in the September 19-25 period. October 1 will herald the start of the championship with the first round being played on a round-robin basis before the 10 teams are split into two categories – the top six move into the Elite Futsal League while the remaining four go into the Futsal League. The second phase of the 2018-19 Malta FA Futsal League will be played over two rounds with the two top-ranked teams in the Elite Futsal League contesting the best-of-five final play-offs. The participating teams are Birkirkara FC Futsal, Luxol St Andrews FC Futsal, Luxol St Andrews FC Futsal Under-19, Pietà Hotspurs FC Futsal, Swieqi United FC Futsal, Swieqi United FC Futsal Under-21, Tarxien Rainbows FC Futsal, University of Malta Students Futsal Team, UM Futsal Academy and Valletta FC Futsal. A novelty this season is the introduction of the promotion-relegation tournament between the two bottom-ranked teams in the top league and the leading two teams in the second tier. Matches will be played on Monday, Tuesday, Thursday and Friday with the Corradino Pavilion confirmed as the main futsal venue. In addition to appointing a Futsal Venue Match Delegate, the Malta FA will have an office dedicated to futsal at its premises while the conditions of the futsal referees have been improved. At national team level, Vic Hermans has been tasked with leading the Malta futsal team as well as overseeing the coaching development aspect. Hermans, 65, he has been in charge of several national futsal teams, including Holland, Malaysia, Thailand and Iran. This is his second spell in charge of the Malta national futsal team. “Vic Hermans is a very respected coach in the international futsal scene,” Dr Paris said. “He also knows Maltese futsal well as he was our national coach before. Besides the friendlies against the Netherlands next month, the Malta futsal team is set to play up to four friendlies against Northern Ireland in October 2018 and January 2019 as part of their preparations for the FIFA Futsal World Cup qualifiers.